Right now you can score your favorite jumbo sized Shampoo and Conditioners for the lowest price of the year now through January 28, 2017 at Ulta. My favorite Redken Frizz Dismiss shampoo and conditioners are usually $38 a piece... they are on sale for only $19.99 a piece. And you can get a pump for only $1. This deal is amazing. Are you an Ultimate Rewards Member? Sign Up Now to receive an additional $10 OFF! 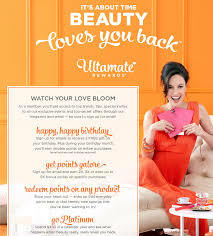 Plus, earn rewards and get freebies on your birthday!